The time is now to reach out to Asheville city council to share your support for active transportation improvements on the Charlotte St corridor north of Chestnut St. This affects all cyclists and your attention is warranted. Charlotte St has the potential to connect a large residential area to downtown; it represents a key link in our future multi-modal grid. It will also be used as a safer route for recreational cyclists who come and go from Elk and Town mountain. There is growing resistance for the Charlotte St road diet and that resistance needs to be countered by you. 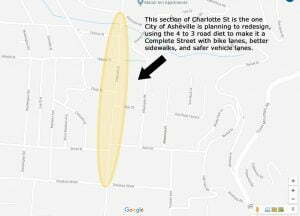 Council members have received several letters opposing safety improvements to Charlotte St. Now is the time to demonstrate your support for Charlotte St road diet. On Tuesday, Nov. 13 city council votes to fund the Charlotte St road diet design. If you support the establishment of an active transportation network it’s critical that you share your support. Support for Charlotte St sends a clear message that the Asheville community supports investments in active transportation options. Asheville on Bikes asks that you do several of the following to support the expansion of Asheville’s active transportation network into Charlotte St.
Email city council at AshevilleNCCouncil@ashevillenc.gov and share your support for Charlotte St road diet. Incorporate a few of the bullet points below. A personal letter of support is more compelling than a form letter. Include a personal experience and / or attach a pic of you, friends, and or family walking and / or cycling. CC AoB at ashevilleonbikes@gmail.com on your letter to city council. Share AoB’s Charlotte St position on your social media platforms and encourage people in your circles to support Charlotte St road diet. Encourage three more people to contact council in support. Reach out to your circles directly and encourage people to send emails of support to city council. I want to safely walk and bike from my house to Charlotte St businesses. Charlotte St Computers, Taco Temple, City Bakery, Ultimate Ice Cream, Chop Shop, Ghan Shan Station, and Waterbird are just a few of local businesses on this corridor. Say the name of the businesses you love. Asheville, NC remains one of the most dangerous cities in North Carolina for all modes of transportation. It’s time to invest in multi-modal infrastructure. A road diet means more biking and walking, and more of that means lower rates of disease and chronic illness for me and my neighbors. By traffic volume, Charlotte St north of Chestnut is a perfect candidate based on the experience of other cities. Traffic volume is 12k-14k/day in the area of this project. Even Charlotte Street’s peak traffic volumes, 20k, which occur only for a few minutes on weekdays at the intersection with Chestnut, are well within the range recommended for road diets. A 4 to 3 road diet gives the corridor room sidewalk improvements and a bike lane. A 4 to 3 road diet reduces collisions for all users; one study of similar complete street designs found a 70% reduction in collisions across 36 projects that were tracked. No one is stuck behind left turning cars, because they use the center turn lane. This is an important project for the future of our City and your actions help determine our future. Thank you for your support. Federal Highway Administration’s Resources regarding Road Diets. 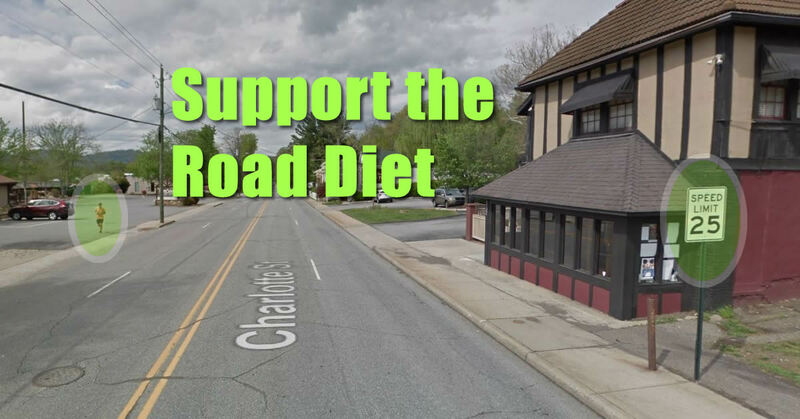 Update: On Tuesday Asheville City Council voted unanimously to move forward and hire the contractor to design the road diet plan for north Charlotte St. Many people spoke in favor, a few spoke against, and many of you wrote letters of support to council. Those letters were acknowledged during the meeting and your support is appreciated. Thank you! Mayor Mannheimer spoke near the end of the hearing about why she and council are strongly in favor of these changes and her words are encouraging. You can watch the video here: https://youtu.be/ATePVAg57vI?t=5497 The Charlotte Street portion starts at 33:24 with a report by Ken Putnam.